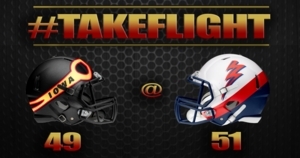 DES MOINES - The Iowa Barnstormers lost a heartbreaker to the Sioux Falls Storm, 51-49, Friday Night at the Denny Sanford Premier Center in Sioux Falls, South Dakota. In the second quarter, Iowa’s running back Donavan Williams marched the ball into the end zone on a short touchdown run, 20-14. Sioux Falls responded with a touchdown run of their own from Brown, 21-20. Storm receiver Harrold Judd caught a touchdown pass from Brown, increasing their lead 28-20. Powell responded by once again connecting with Roland for a Barnstormers touchdown, 28-26. The Barnstormers defense scored a safety tying the game, 28-28. A touchdown run from Barnstormers running back Donavan Williams put Iowa in the lead at the half, 35-28.